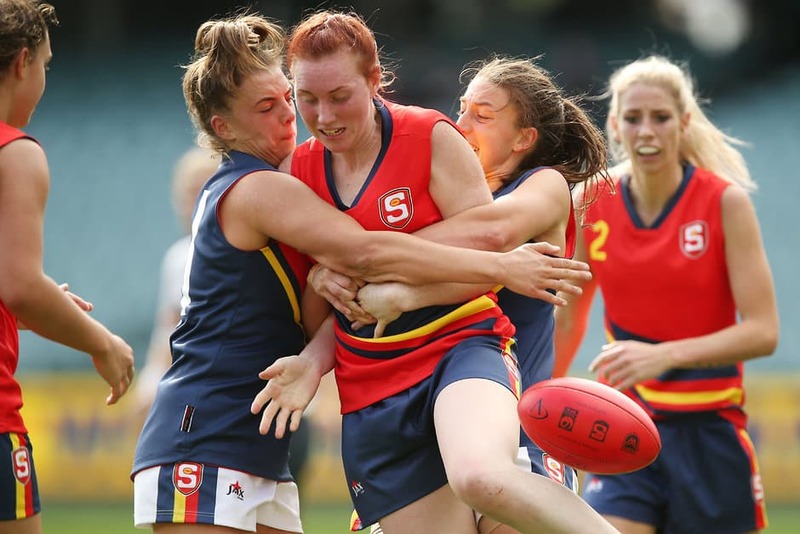 South Australia Blue has taken the honours in the second AFL women’s exhibition game of the year, beating South Australia Red by two points on Saturday afternoon. In perfect conditions and in front of an impressive crowd at Adelaide Oval, the two teams battled it out in a match that saw several momentum swings. It was a nervous start for both sides with plenty of stoppages and lots of pressure. Last year's No. 2 draft pick, Danielle Goding, made her presence felt early, getting her hands on the ball and winning a number of hit-outs for SA Red. Eventually the game opened up when former soccer player Kelly Barltrop used skills from her previous code to 'soccer' the ball through for SA Blue’s – and the game’s – opening goal. Barltrop's goal was the only one for the quarter, with SA Red going into the quarter-time break scoreless. Blue continued its dominance at the start of the second quarter when first-gamer Allison Evans marked the ball on the goal line and followed with a major. Eighteen-year-old Ebony Marinoff was dominating play for Blue, racking up possessions in the midfield. Red finally settled and responded, with midfielders Deni Varnhagen and Georgia Bevan providing plenty of run-and-carry through the middle to lead the turnaround. Their strong worked saw Red kick the next three goals, with scores level at the main break. Red started the second half well, its confidence lifting and the players’ skill and class coming to the fore. Utility Caitlyn Swanson showed her talent when she impressively marked in the forward pocket and ran around to snap the goal. Red led by six points at the final change. Fitness became a factor in the fourth quarter, with both sides evidently feeling the pinch. Varnhagen was taken from the ground with cramp, with Blue continuing to push forward and threatening to take the lead. To counter this, Red moved Swanson to defence and she took a number of intercept marks to thwart scoring opportunities. However, Swanson couldn’t do it all and eventually forward Danielle Stewart snuck one through to put Blue in front. Red tried valiantly in the final minutes, but Blue hold on for a hard-fought and satisfying win. Marinoff (37 possessions) was named Blue’s best player, while Bevan got the nod as Red’s best.